A little bit nautical and a whole lot nice! 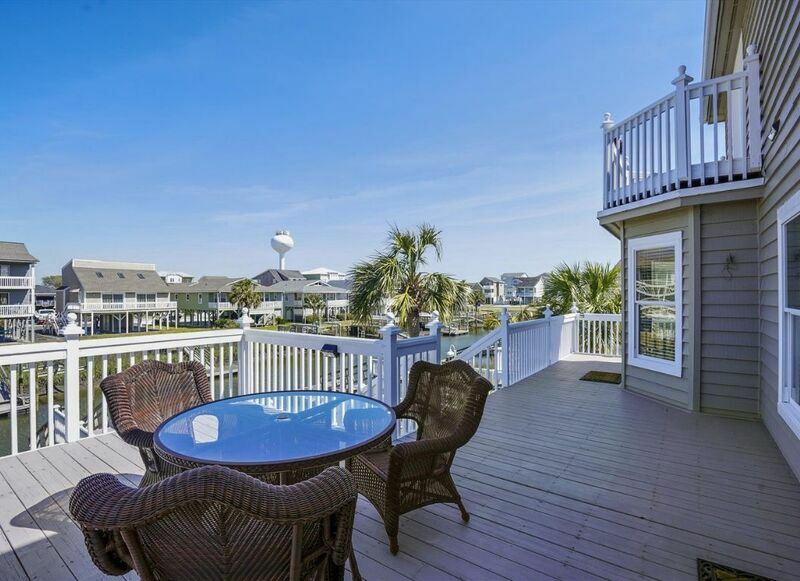 You will love this spacious canal house with a private boat dock.Conveniently located to shops, restaurants and beach (within walking distance a bike ride). Decks, skylights, volume ceilings, and an open floor plan on the main level make it easy to enjoy the house inside and out. This is a 4 bedroom / 4 bathroom property that sleeps 10. The master suite has a king bed and private bathroom, plus there is a second bathroom on the main level, and a queen sleeper sofa. Upstairs there are three more bedrooms and two bathrooms. One bedroom has a queen and twin bed and a private bath. The other two bedrooms share a Jack & Jill bathroom. One has queen and twin beds and the other (canal facing with a private balcony) has a queen bed. All bedrooms have plush carpets; the rest of the house has wood or tile floors. There is a TV in the great room and every bedroom, and wi-fi throughout. Other amenities include a well-stocked kitchen, complete with a Keurig coffee maker, a gas grill, and an outside shower with hot and cold water. Boaters, the dock will accommodate up to 26’.